If your summers are anything like ours, deli coleslaw is nearly always on the table at cookouts. Everyone loves it. And for good reason: it’s guiltily tasty. But, you definitely don’t want to read the list of ingredients on the label. Coleslaw doesn’t have to be the guilty pleasure you know you should avoid at summer cookouts. After all, cabbage is super healthy. It is high in vitamins C and K, magnesium, and folate. It also has an impressive list of antioxidants. And in its natural state, cabbage is low in calories and high in fiber, so it keeps you full on just a few calories. It’s one of the most inexpensive ways to get a huge bang for your buck as far as nutrients are concerned. So really, cabbage should be a go-to food, not something you shy away from at cookouts. Today, we’re taking back coleslaw and making it healthful again. While you could make your own creamy coleslaw with homemade mayonnaise to stay a bit more true to the original, lets face it, mayo (even homemade), while good in small doses, still isn’t the healthiest ingredient to be loading up on. To stay true to the healthy nature of cabbage, this creamy deli-style coleslaw is made with plain yogurt, rather than mayonnaise. Yogurt gives the coleslaw a nice creaminess and tang, while eliminating much of the fat that mayo would add. So your coleslaw gets all those great, gut-healthy benefits of yogurt! One fun thing about making homemade coleslaw is that you have more control over which veggies go into the dish. The most classic veggie combo is cabbage, onions, and carrots. But, you can switch things up with red cabbage or red onions to add an extra pop of color. Or add in some chopped broccoli, cauliflower, or peppers if you really want to mix things up. I like to shred my own cabbage when I make coleslaw. I find it strangely satisfying to watch the tiny shreds fall away from the cabbage head as my knife slices through. But if you wanted to make this healthy yogurt coleslaw even easier, you could grab a pre-shredded bag of coleslaw mix and just toss in your homemade dressing. This coleslaw recipe hits all the flavor marks of your classic deli-style coleslaw. It’s sweet (but not too sweet), and slightly tangy, with a nice balance of celery and other seasonings. In a medium bowl, mix the dressing ingredients together until evenly combined. In a large bowl, mix the cabbage, carrots, and onions together. Pour the dressing over the veggies and mix until well-coated. 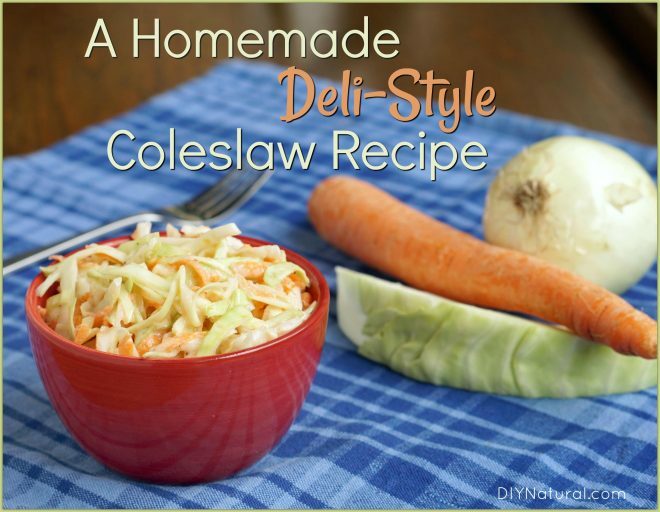 For best flavor, refrigerate the homemade coleslaw, covered, for 1 hour before serving. Stir your coleslaw well before serving to re-distribute the dressing. Made this for a 4th of July celebration and it was a huge hit! Thanks for the great recipe Sarah!